How will I know when I am cured of bedbugs? When should I call a medical caregiver about bedbugs? Bedbugs are parasites (insects) that survive by feeding on blood from humans. They are small, brownish-colored, and live in furniture cracks, beds (especially the mattress, box springs, and other structures such as the bed frame) but also can be found in travelers' suitcases and other items. Their highest concentration is usually within about 8 feet of a location where people sleep. They are active (seek a blood meal) at nighttime and just before dawn; they usually bite any exposed area of the skin (for example, the arms, hands, neck, and face). The bite is usually painless, but eventually multiple bite sites resemble a rash and become itchy. Bedbugs are not known to readily transmit other diseases, although a few investigators suggest that rarely, hepatitis B and/or Chagas disease may use bedbugs as a vector for these diseases. Bedbugs are not contagious in the sense that they live on people and are transmitted directly from person to person. What happens is that bedbugs utilize humans for a blood meal and then leave the person's body. It seems like bedbugs may be contagious because they can live in some people's clothing, bedding, and furniture. These items, when utilized or transported during travel, can contain bedbugs waiting to encounter another warm body for a blood meal. Most experts suggest that the main hosts for bedbugs are humans and indicate that pets like dogs and cats usually are not bitten (not all experts agree on this); however, bedding material used for pets may serve as a site for bedbugs especially if the pet bed is located close to bedding used by pet owners. Sometimes it is difficult to tell if a person has been bitten by bedbugs. Because the insects leave the person's body after a bite, and bites usually occur when a person is sleeping, many people do not know how they got this "itchy rash." In most instances, there are no lab tests used to detect bedbugs; however, simply using a magnifying glass while examining items such as mattresses or clothing (especially the seams in mattresses and cracks in furniture) for bedbugs, their eggs, or droppings is usually the quickest and best way to determine a bedbug infestation. 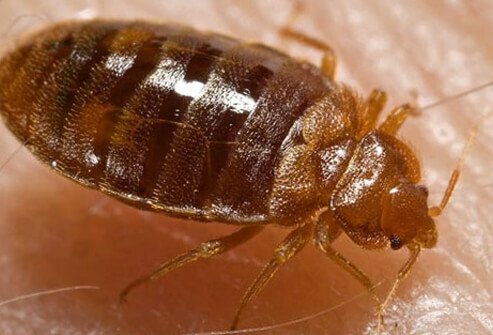 Many news reports in recent years have focused on the discovery of bedbugs in even upscale hotels, and a number of lawsuits have been filed by guests in these fashionable hotels who awoke to find hundreds of bedbug bites covering their skin. Searching on travel-review web sites regularly reveals information and even photos confirming the presence of bedbugs in numerous hotels. Bedbugs are not spread directly from person to person. As stated above, they are spread by travelers and/or people who come in contact with bedding, clothing, or furniture that contains bedbugs. Travelers can have bedbugs infest their luggage and thus can transport bedbugs back to their home. Bedbugs, once established in a residence, can travel to reach individuals through ventilation ducts, water pipes, and even gutters. Bedbugs have even been shown to cross over ceilings and then drop down onto a person to get a blood meal from an individual. Bedbugs usually require the services of an exterminator to kill the insects. Exterminators may use various methods such as chemical insecticides and/or heat treatments to kill the insects. Once the insects are killed, the biting stops and the person is "cured" of bedbug bites. Individuals who have been bitten by bedbugs and who have other diseases that may be rarely transmitted by these insects (for example, hepatitis B) should inform their caregivers and ask for advice about bedbugs being a vector for their disease. Similarly, family members of such individuals should contact their physician if they get bedbug bites as they may be exposed to the disease in a family member. Anyone developing shortness of breath and/or swelling of the neck or tongue after a bedbug bite should go to an emergency department. What prompted you to seek medical care for bedbugs? That unexplained itching could be caused by bedbugs. Take the Bedbugs Quiz to learn the causes and symptoms of a bedbug infestation. Chagas disease is an infection caused by the T. cruzi parasite. Symptoms of Chagas disease include rash, swollen lymph nodes, fever, fatigue, nausea, vomiting, and the Romaña sign. An ELISA test is used to diagnose Chagas disease. Treatment depends upon the phase of the disease and the patient's age.